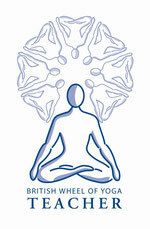 I'm a member of the British Wheel of Yoga (BWY) and hold their prestigious 500 hour Yoga Teacher Diploma. The BWY is recognised by Sport England as the UK's national governing body and through them I have a wonderful network for continuing professional development. Since graduating the BWY Diploma, I've pursued my passion for learning and with a wide range of master-classes and private tuition from other inspiring teachers amounting to over 200 hours of further study. As a qualified counsellor, trainer, mediator and reiki healer I am fascinated by people and what makes them tick, what lights you up, finding the magic ingredient to make Yoga sing through your body and mind. Beyond all this, I believe what qualifies us best is being human and dropping into our bodies and breath to find our connection to the earth, to ourselves and to each other.